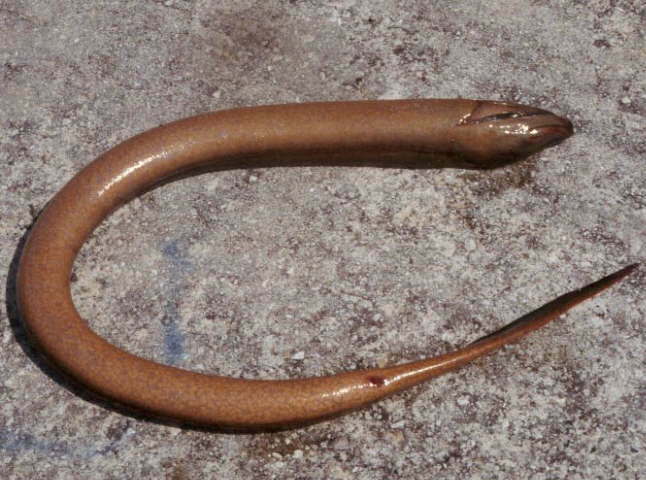 Swamp Eels seem to have taken the "less is more" thing to an extraordinary degree. Apparently, great success and durability can come from simply ridding yourself of various body parts. I don't recommend anyone experiment with this idea, but if you do happen to try it out of your own volition because you wanted to and it's your responsibility and you did it and it has nothing to do with me... consider leaving your fingers to last so you can leave a comment and tell us all about your experience. 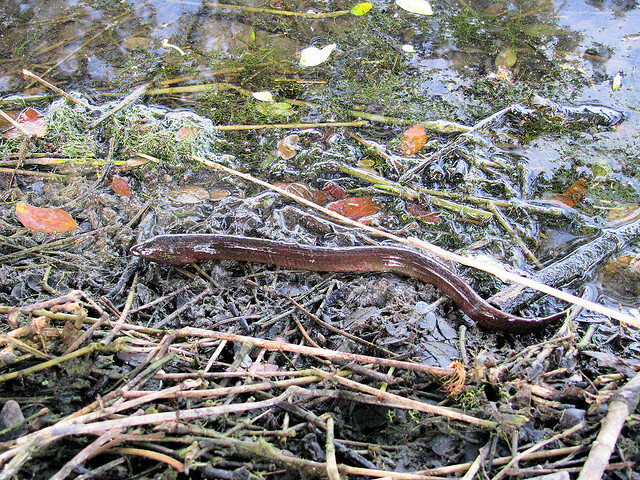 There are more than 20 species of Swamp Eel and none of them are really proper eels. They're just long, thin fish. The longest of all can reach over a metre (3.3 feet) in length, the smallest just 8.5 cm (3.3 in). They come from shallow, stagnant or slow moving freshwaters in tropical areas across the world, but they can also tolerate brackish and cold water, too. Firstly, their eyes are tiny and some have no eyes at all. Most have no scales on their skin. They have almost no fins left. Some retain a small tail fin, others don't even have that. They have no swim bladder. Their gill membranes have all fused together and they have just one gill slit or pore under the throat. You might think that life would be tough for a fish that has lost so much of its body, but they have one extremely useful development. Their mouth and throat is highly vascularised (has lots of blood vessels) so that they can act like a sort of lung. This means they can survive in water with low oxygen levels by rising to the surface and breathing air. But they can also survive at least a while with no water at all. Burrowing into soft mud means they can survive droughts and after rains they can even travel across land to find whole new bodies of water to live in. Once they get there they're pretty much guaranteed lots of food because they are generalist predators, eating fish, shrimp, frogs, worms and pretty much anything else they come across. Maybe it's like that mechanical thing where the less parts you have the less there is to go wrong? 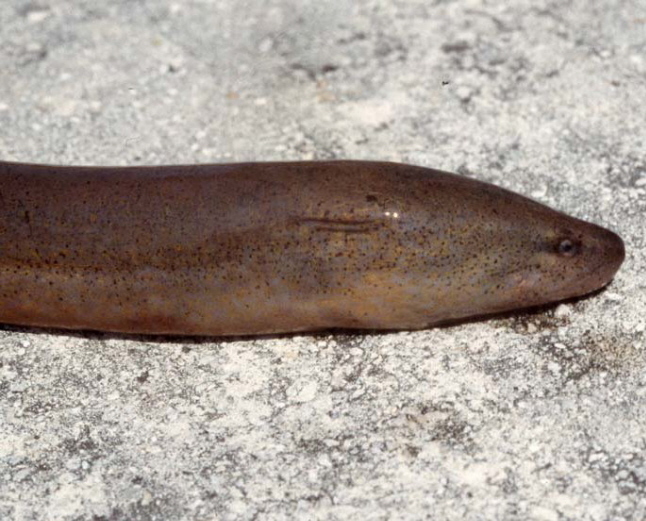 Speaking of parts, most Swamp Eels start out female and become male later on in life. They'll change back into females if there are way too many males in the area, though. They're pragmatic like that. 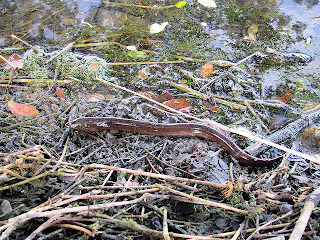 Swamp Eels mate any time they want, there's no breeding season. Eggs are laid in nests of bubbles which the male guards. When these hatch, the youngsters come out with large pectoral fins, which are the ones on the sides behind the head. These help them swim for a couple weeks before they lose them and take up adulthood. When it comes to Swamp Eels, fins count as "childish things". I think I'm actually jealous of this creature. I want fewer parts. ...chainsaw? No, parts are great when you're using them and tedious when you're not. Having parts as Barbie style accessories added and removed as and when desired, that's the dream! Very true! Although they may object to you calling it "handy". I don't know what they'd prefer... taily? This is just a worm that snuck into a fish convention. Can't fool me! Sounds less like Barbie and more like Mr. Potatohead, really. You think a Swamp Eel ever shirked his fatherly guard duty by turning female?